Disorder is generally thought to be detrimental to creating materials with unusual magnetism or other quantum phenomena. However, a team found that weak disorder surprisingly stabilizes a rare quantum state called a quantum spin liquid. In this state, fluctuations of electronic spins persist all the way to temperatures near absolute zero. The particular material is made of praseodymium, zirconium, and oxygen (Pr2Zr2O7). The material contains rare earth ions (Pr3+) with an even number of electrons on a weakly disordered crystalline lattice. 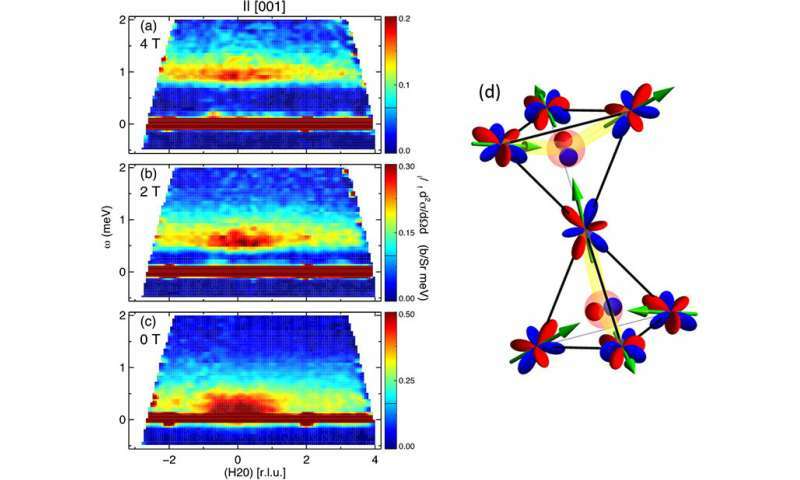 While the crystalline lattice frustrates conventional magnetism, weak disorder promotes the rare quantum spin liquid state. The discovery that weak disorder can induce this rare state opens a new direction in the quest for a practical quantum spin liquid. This state of matter could be useful as building blocks for quantum computers. These computers could be orders of magnitude faster than today's computers. This speed translates into computational power to solve problems that can't be feasibly solved today. A rare state of matter called a quantum spin liquid proposed over 40 years ago is being pursued for its unique physical properties. In a quantum spin liquid, electronic spins do not form a static ordered pattern as in conventional magnetic materials, but fluctuate in a coordinated (entangled) fashion even at extremely low temperatures. But can such quantum fluctuating states of matter exist in practical materials which are inevitably disordered and can quantitative information about them be extracted from neutron scattering experiments? Towards addressing such questions, a team of researchers led by Johns Hopkins University studied a pyrochlore oxide with the chemical formula Pr2Zr2O7. Conventional magnetism is frustrated by the geometry of the pyrochlore lattice when magnetic ions occupy a specific location in the crystal lattice and this can lead to exotic magnetic states. Combining solid-state synthesis, high-quality single crystal growth, and advanced neutron scattering, this research unveiled the presence of a quantum spin liquid in Pr2Zr2O7. The inelastic neutron scattering data show the signature for this rare state where a band of (inelastic, w>0) scattering intensity persists at temperatures close to absolute zero. This research points to a new paradigm that at appropriate levels, weak structural disorder may actually promote the formation of a quantum spin liquid with entangled electronic spins. This ability to manipulate and induce quantum magnetism in spite of disorder could pave the way for new and more practical materials with the elusive quantum spin liquid for applications including quantum computing.